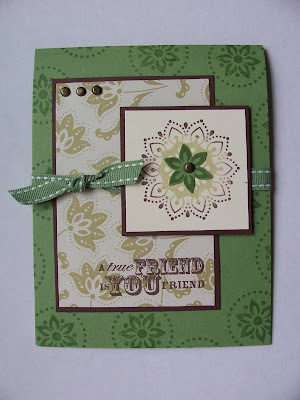 I made this card for the featured stamper challenge over at SCS (papermoon04). I picked this card because of the layout. It's right up my alley! For the main image, I inked up the "flower" in river rock, and then rolled just the edges in chocolate ink before stamping. Sorry the picture isn't so great, there's not a lot of natural light here today! This is beautiful, and the colours look fantastic! Awesome card! Love the layout and colors! Great card! I love this set! This is so pretty, I like how you used the two colors on your center flower, great job! wow !!!! this is beautiful !!!! Acetate Cards Are My New Favorite!